Crochet Club: The Out & About Backpack! Perfect for summer outings, Kate Eastwood’s gorgeous “Out & About” Backpack is great fun to make, and a perfect gift! Customise your finished bag with a bow, crochet flowers or pompoms for that extra special personal touch! On those ‘out and about’ sort of days, what could be more perfect to put all your bits and bobs in than this pretty backpack! The measurements of the finished backpack are approx. H 42cm x W 37cm x D 12cm, and it is modelled here by my daughter who is 5’4” tall. The backpack is designed to have a flap over top, under which is a drawstring tie and there is a small carry handle at the top of the backpack , as well as two shoulder straps. Kate Eastwood has so many fantastic tutorials, why not check out her dazzling Sparkly Stars Cushion FREE tutorial by clicking here! I used four balls of Hoooked Eco Barbante for my backpack in Gris 0270 using a 3.5mm hook. This yarn is perfect for a bag as it creates a really strong, un-stretchy texture that will allow your bag to keep its shape. As this yarn is a little too stiff to create a soft border, I used 1 x ball of Sirdar Cotton Rich Aran in Cream 0001 for all my edging using a 4mm hook. You will also need approx. 75cm of cord for the drawstring, some ribbon and a popper to fasten down the flap. The pattern is written in UK crochet terms, but you can translate into US terms using our handy conversion tables. The backpack is made with an oval base and then the main body of the bag is added on to this and worked in the round. The flap top and straps are added on separately afterwards. To begin make a chain of 26. Round 1: Starting in the second chain from the hook work 1 DC. Work a DC in to each of the next 23 stitches and then work 3 DC in to the last stitch. You are now going to continue on round by working down the other side of the chain. So, continuing on round, work a further 23 DC, 2 DC in first stitch, then join with a SL ST in to the first stitch. 52 sts. Round 2: Chain 1, work 2 DC into the first DC, DC 23. Work 2DC into each of the next 3 stitches, DC 23, 2 DC in each of the next 2 sts and then SL ST to join. 58 sts. Round 3: Chain 1 and work 2 DC in to the next stitch, work 4 DC, 4 HTR, 9 TR, 4 HTR, 4 DC. Work 2 DC in to each of the next 4 sts, 4 DC, 4 HTR, 9 TR, 4 HTR, 4 DC, 2 DC in each of the next 3 sts, SL ST to join. 66 sts. Round 4: Chain 1, 6 DC, 4 HTR, 9 TR, 4 HTR, 6 DC. Work 2 DC in to each of the next 4 sts, 6 DC , 4 HTR, 9 TR, 4 HTR, 6 DC, 2 DC in each of the next 4 sts, SL ST to join. 74 sts. Round 5: Chain 1, work a DC in to the same st and work DC all the way around. SL ST to join. 74 sts. Round 6: Chain 1 , 2 DC, 25 HTR , 2 DC. * 2 DC in next stitch, 1 DC, 2 DC in next stitch , 2 DC*, Repeat from * to * once. 25 HTR, 2 DC, 2 DC in next stitch, 1 DC, 2 DC in next st, 2 DC, 2 DC in next st, 1 DC, 2 DC in next stitch, Sl ST to join 82 sts. Round 7: Chain 1 and work a DC in to the same stitch. DC all the way around. SL ST and join. 82 sts. Round 8: Chain 1 ,1 DC, 2 DC in next stitch, 25 DC , (2 DC in next stitch followed by 1 DC ) twice, (2 DC in next st, followed by 2 DC) three times, 2 DC in next stitch, 1 DC, 2 DC in next stitch, 25 DC, ( 2 DC in next stitch, 1 DC) twice, ( 2DC in next stitch, 2 DC ) twice, 2 DC in next stitch , 1 DC, 2 DC in next stitch, Sl St to join, 96 sts. Round 9: Work a round of HTR, 96 sts. At the end of Round 9, SL ST to join and finish off, sew in your ends. You are now going to start working on the main body of the bag, but first you need to lay your base piece wrong side down and mark 34 stitches along one edge, using stitch markers. This will be the back edge of the base , the rest of the stitches (60 sts) will be the front part of the backpack and we will be increasing in to these stitches to give the bag its shape. When you reach the second stitch marker you are now going to start your increasing, so into the next stitch work 2DC, Your next stitch will be a regular DC and the following stitch 2 DC in to one. Continue this pattern all the way around and back to the first stitch marker. SL ST to join. You should now be able to see that you have a straight back edge to the base and then a curved shape to the front edge of the base. You should now have 124sts. You are now going to continue working in rounds. At the end of each round, SL ST to join. Pull your yarn nice and tight, yarn over and pull through. Pull the yarn tight. Now, keeping your tension tight, chain 1 and then work a DC all in to the same stitch. You are now ready to continue working your next round of DC. Continue working in rounds ( 124 sts) until your work measures approx. 36cm from the straight edge of the base to the top. Finish off and sew in ends. In the next 2 rounds you will be making the holes for the drawstring tie, so start by placing your two stitch markers on the back of the bag, to mark the beginning and end of the flat edge (32 sts). * DC 5, CH 2 and skip 2 stitches * five times, DC 2. Work 34 DC , which will bring you back to the first stitch marker. Do not SL ST and join as in previous rounds, as we are just going to work in a continuous round from now. So, continuing on round, work a round of DC, working 1 DC in to each of the two chain stitches from the previous round. At the end of this round work a further two rounds, finish off and sew in ends, leaving the stitch markers in place. To thread your drawstring, take your piece of cord and cut it in half. Tie a large knot at one end of each piece and thread the cord in and out of the buttonholes, beginning with the knot on the inside at the back edge. (Note: the cord runs across the front of the back pack only, so there will be no cord along the straight back edge.) The two buttonholes at the centre front are where you will be pulling the cord through to the front. Adjust the length of the cords and tie knots in the ends. Row 1: Starting in the 2nd chain from the hook work 2 DC in to the first st, DC, then work 2DC in to the last stitch. 12 sts. Ch 1 and turn. Row 2: DC 2 in to the first stitch, DC 12 , DC2 in the last stitch. 14 sts. Chain 1 and turn. Row 3: DC 2 in to the first stitch, DC 14 , DC 2 in the last stitch. 16 sts. Chain 1 and turn. Continue working this pattern until you have 32 stitches. Work 27 rows of DC, remembering to ch 1 and turn at the end of every row. Finish off and sew in ends. Using the cream yarn and a 4 mm hook work a round of DC all the way around the edge of the flap, working 3 DC in to the corner stitches. For the second border row work as follows: SL ST, * skip a stitch, HTR, 3 TR, HTR all in the same stitch, SL ST in to the next st *. Repeat from * to * all the way around the edge. Finish off and sew in ends. Using the cream yarn and a 4mm hook Chain 35. Beginning in the second chain from the hook work 14 rows of DC, remembering to ch 1 and turn at the end of each row. Fold the strap in half lengthways, wrong sides together and join together with a row of DC. Finish off and sew in ends. Chain 101, and starting in the second chain from the hook work 11 rows of DC, remembering to chain 1 and turn at the end of each row. Finish off and sew in ends. Fold the straps in half lengthways and using the cream yarn and a 4 mm hook, join together with a row of DC. Finish off at the end of the row. Using the cream yarn and a 4 mm hook work a round of DC around the edge of the base of the bag. As this is the round where you were working in to the back loop only you will only be working in to one loop. For your second round work the same scallop edging as before. To finish your bag, pin your hand strap and shoulder straps on to the front flap. I found it quite helpful to mark the central point of the flap so that you can get the straps evenly placed. Using a needle and some strong thread sew the straps in to place. Use your stitch markers to position the flap on to the bag, pin and stitch in place. The final step to complete your backpack is to add either a bow or perhaps some crochet flowers to decorate the front flap. Sew a popper on the underneath of the flap and onto the front of the bag to secure the flap in place. Ready to crochet your very own cute backpack? 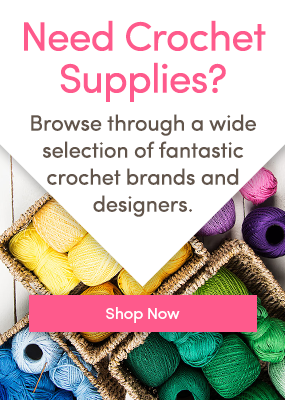 Get all the yarn you need as well as a Pony Easy Grip hook in one easy crochet pack by clicking here. Want to brush up on your crochet skills? Click here, to explore our guide to crochet stitches. Crochet Club: Free Flower Baby Blanket by Kate Eastwood Crochet Club: Kate Eastwood’s Sparkly Stars Christmas Stocking! Crochet Club: Spotty Sunhat by Kate Eastwood Crochet Club: big squishy crochet rug! Kate Eastwood Living just outside Bath, Kate is fortunate enough to be able to indulge two of her biggest loves -- living right in the middle of the countryside but within easy distance of retail therapy. When not working at her nursery school she loves nothing more than a day of pootling around, with crochet, sofa and tea being right at the top of the list. 34 Responses to Crochet Club: The Out & About Backpack! May I ask why the oval base is shaped a little differently (with htr on the long sides)? Does it stand up better that way? Love that yarn for the backpack. I am looking for the pattern for the white hat with grey bobble stitch and pom pom. Can you help. Thank you for the pattem. Do you have a youtube ch that i can see the video tutorial? I would love to crochet this bag but would need a tutorial if you have made one. Hi- this grey back sling is so pretty!! Does she also sell these? I would love to order one. Denise just wondering if you order one of these from her? If you are still wanting one I do custom knitting and crocheting. I have a facebook page. Your pattern says that you used 4 balls of Hoooked, but not which size balls – the 50g or the 200g. So cute!! Can’t wait to make. I think I might use a bigger needle and double strand yarn! Thank you for awesome patter! I too have teenage grand-daughter! Thanks so much! Working on this bag…but at the end of row 3 I come up with 67 stitches…I’ve gone back to the pattern, and it is written for 67 stitches…not 66. Can you help? Is this an error? If I dc in same st as join and then follow the rest of the instuctions, the stiches add up to 67. The same thing happens in row 4, and 6. Possibly others too…I haven’t gotten further than that yet. Please help. I have the same problem. It seems that something is wrong with the pattern at round 3 and 4. I have tried to crochet this at least 4 times… Something is not correct with the stitches. Omg, me too. Round 3 has me so confused . I am wondering if all the extra hdc htr’s are really needed. Row 6: ch1 and DC in same st. DC, DC, 2 DC in same st, 2 DC in same st, DC, 2 DC in same st, DC, 2 DC in same st, DC, DC, DC, then do 23 HTR around, then DC, DC, DC, 2 DC in same st, 2 DC in same st, DC, 2 DC in same st, DC, 2 DC in same st, 2 DC in same st, DC, DC, DC, 23 HTR. Then in row 8: ch1 and DC in same st. DC, DC, 2 DC in same st, 2 DC in same st, DC, DC, 2 DC in same st, DC, DC, 2 DC in same st, DC, DC, 2 DC in same st, 2 DC in same st, DC, DC, DC, then do 23 DC around, then DC, DC, DC, 2 DC in same st, 2 DC in same st, DC, DC, 2 DC in same st, DC, DC, 2 DC in same st, DC, DC, 2 DC in same st, 2 DC in same st, DC, DC, DC, then do 23 DC around. I think this is right! Let me know if it works! I ran into the same problem with this pattern. I did it four times and I kept making an weird shape that wasn’t symmetrical. I figured out that if you take out the chain and first DC, it does the trick. Leaving them in creates 6 extra stitches by the end of the base. can i just buy this from you!! i love it but i can not make it super cute!! this will really be handy to use on my walker or wheelchair I can’t wait to get startedthank you . Very cute! I love the bow myself. Would like the pattern for the iPad cover? (if that is what is pictured with the bag) and if okay, would like to make these three (what is pictured above) in a YouTube video? I would link back to the patterns and not take credit for the patterns.. This brand of yarn looks primarily European. Is there a similar type I can buy in the US? I went to joann fabrics and the lady told me any cotton will do because it doesnt stretch out. I bought peaches and cream. They also have an Bernart cottonish that is a cotton and acrylic blend. THIS WILL BE A NICE GIFT FOR MY GRANDDAUGHTER TO USE FOR HER BABY THINGS. Is this pattern in us terms ? How many yards of yarn does this bag take. Says 4 balls of the specified yarn and would like to know the yardages. Thanks for your help. Do you have a printer friendly pattern for this adorable backpack? Most web browsers have an option to print webpages with just the text, see if you are able to do that perhaps? Looking forward to this project! I have started, but at the part where you add stitch markers & crochet in back loops for the 34 stitches, do you continue to crochet in back loops or back to regular for the remainder of the row? Thanks! Hello, I noticed the stitches say double crochet but the backpack looks like it’s single crochet. Im confused.